transformations of the scientific discourse around it over time and across different geographies. Takeshita describes how developers of the IUD adapted to different social interests in their research and how changing assumptions about race, class, and female sexuality often guided scientific inquiries. 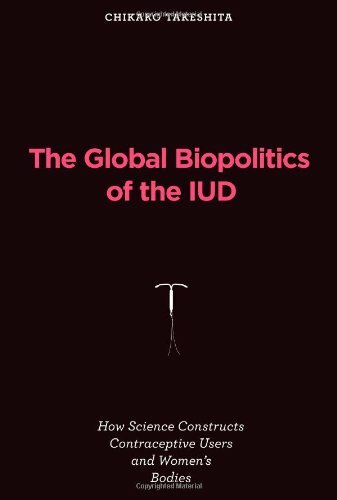 The IUD, she argues, became a "politically versatile technology," adaptable to both feminist and nonfeminist reproductive politics because of researchers' attempts to maintain the device's suitability for women in both the developing and the developed world. Takeshita traces the evolution of scientists' concerns, from contraceptive efficacy and product safety to the politics of abortion and describes the most recent, hormone-releasing, menstruation-suppressing iteration of the IUD. Examining fifty years of IUD development and use, Takeshita finds a microcosm of the global political economy of women's bodies, health, and sexuality in the history of this contraceptive device.